This page lists all reports that for UK only that do not involve other countries. Click here for a list of all reports involving UK. My 5 year old son and I rode from Manchester Airport to London via Hindhead. We rode for 10 days, 350 miles, and did 13,000 feet of climb. We visited Ironbridge, the Costwolds, and Oxford along the way. Voyage de 28 jours au départ Douvres, dans le Kent, jusqu'aux îles Orcades (Écosse) par la route cycliste N°1, la plus longue du Royaume-Uni. Vélo robuste et pneus anti-crevaison indispensables pour franchir sans encombre les nombreuses sections hors bitume de ce bel itinéraire très bien balisé. A 28-day journey between Dover (Kent) and Orkney islands (Scotland) along National Cycle Network Route 1, the longest cycle route in the UK. You'll need a strong bike and puncture-proof tires to get across the numerous off-road sections of this beautiful and perfectly signposted itinerary. In French. Ich berichte von einer sonnigen Radfahrt in Schottland. Immer auf der linken Seite der Straße führt mich mein Weg bis zu den Äußeren Hebriden, einem wahrhaft abgelegenen Flecken Europas! In zwei Wochen entdecke ich die liebenswerten Seiten dieses Landes. From my base in Manchester I made two cycle tours, one to North Wales and one into the Pennines. 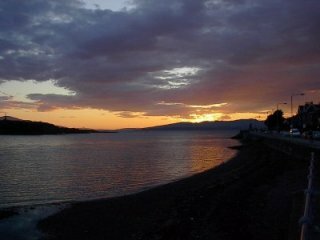 The purpose of these cycle tours was, besides the recreational effect, to explore historical objects on rails and water. The classic 'End to End' ride in seven daily stages of over 200 km, under the rules of long distance cycling association Audax UK. Crosses many of Britain's finest landscapes including Dartmoor, the Somerset levels, Wye Valley, Lake District, Scottish Highlands and Caithness coast. A 650-mile trip connecting the westernmost with the northernmost tips of mainland Britain, following the western and northern coasts as closely as possible. All of this on a Scorpion fs recumbent tadpole trike. A 12 day unsupported ride from the most south westerly to most north easterly point of Britain. I also passed through the most southern point, Lizard Point, and the most northern point, Dunnet Head. I covered 1074 miles passing through some of the most beautiful parts of Britain. 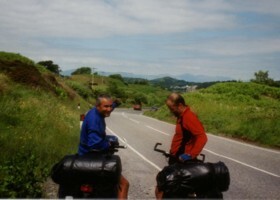 In 2009, we took our trusty tandem out for the usual cycle tour in Scotland. This year we rode a circuit that encompassed Loch Tay, the Isles of Mull and Skye, and the Black Isle. 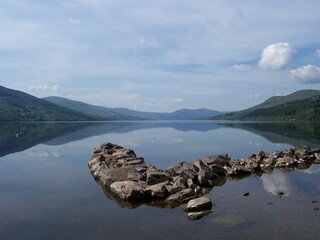 We had fabulous weather, fabulous food, fabulous scenery and above all fabulous fun! I'm cycling to every York City league match next season, home and away. 11 day trip from Inverness, onto Lewis, up to the top and then all the way down to Barra. Fantastic places including the legendary St. Kilda. Reading Calmac's `Explore' brochure on the ferry from Claonaig to Lochranza rekindled my desire to visit the Outer Hebrides. My Mum and Dad had taken the boat to Barra during their courting days and forever regaled us with tales of rough seas where everyone on board including the crew were sea sick apart from them. Then when queuing for the boat at Brodick, I watched as lots of fully laden pannier clad bicycles disembarked. I'm not getting any younger and the rucksack no lighter so a bike seemed the best way to carry the weight whilst sparing my vertebra. I resolved to take the boat from Oban, cycle from Barra to Lewis and return on the Stornoway to Ullapool ferry. The final details, including the logistics of getting self and bike to Oban and back from Ullapool seemed the least of my problems. Oh, and I needed a bike! Ten day tour of the western islands and coast of Scotland - Skye, Outer Hebrides, Mull and Ardnamurchan. Beautiful beaches, mighty headwinds and plenty of sheep. A short and rather hilly round-trip tour of Dorset, South Devon and Somerset, including portions of the spectacular Jurassic Coast. This tour was from the north east corner of England to the west coast of Scotland and included a few day on the island of Arran. We travalled with full camping gear but becasue the rain stayed a several B&B's. Several of the B&B were very memorable and are detailed in The Daily Log and Useful Links page. Route maps are included - much the route followed the National Cycle Network. My first tour and the reason the web site was set up in the first place. The site's original purpose was to help raise sponsorship for an unassisted charity cycle ride originally called the 'Anglo-Swiss Charity Bike Ride', after the nationalities of the two participants. It was an unforgettable trip of a thousand miles on a pair of poorly equipped mountain bikes that raised over £1,500 for the National Autistic Society. Some road rides in the English Lake District (will be added to). Includes the (in)famous Fred Whitton Challenge route. 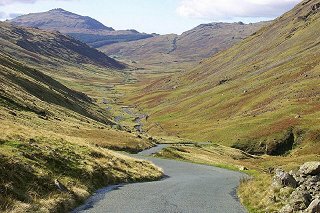 A demanding ride which takes you through some of the most stunning scenery the Lake District has to offer and includes the major passes of Kirkstone, Honister, Newlands, Whinlatter, Hardknott and Wrynose. If your touring the Lake District try to fit this ride in - it can easily be split into 2 days. I just completed a bike trip through the heart of England, starting in London and following the Thames to Oxford and Stratford-upon-Avon using the National Cycle Paths. From there I curled down through the Cotswolds. Die Warnungen von Freunden und Bekannten bezüglich des dortigen schlechten Wetters erschreckten mich nicht. Die Landschaft ist von Bergen, Seen und Hochmooren bestimmt und das bedeutet für den Radler: alles andere als flach. Kurze, kräftige Steigungen sind die Regel. Doch ich gewöhne mich schnell daran und die Ausblicke, die sich bei diesen Berg- und Talfahrten ergeben, sind vielfach faszinierend. Ich mache zum ersten Mal Bekanntschaft mit den schottischen Mücken, midges genannt. Sie sind winzig klein und treten teilweise in Massen auf. Heute Abend hilft nur noch die Flucht ins Zelt. Die Jugendherberge in der Armadale Bay liegt idyllisch in einer Bucht. Regen und Sturm am Abend rauben der Idylle jedoch ihren Mythos. Am nächsten Morgen regnet es immer noch, als ich mich in der Jugendherberge herumrücke und auf Wetterbesserung hoffe. Ein älterer englischer Radfahrer klärt mich bei seiner Abfahrt über die Wetterlage auf. The weather is better than it looks gibt er mir mit auf den Weg. Also - das Wetter ist besser als es aussieht. We can't remember where the idea originated, but we'd been thinking about riding the length of the British mainland for some time. For one reason or another we had never actually got around to doing it until, towards the end of 1999, Linda said that ``if we don't do it this coming year, we probably never will''. So that's how it started! In the following pages you will read of our epic journey. Looking back on it now it doesn't seem half as big an undertaking as it seemed at the start. When you are stood at Land's End looking at the road leading away to the north you wonder why on earth you are doing this. Are we really going to cycle all that way? Can we really do it? Will the bike be up to it? What if we have a breakdown? What if we get into trouble amongst the traffic? We now know that it can be done. We know that, although the distance is great, it's not impossible. If each day is taken on its own it's not really such a big task. We aimed for around 60 miles per day, based on the fact that that's roughly what we are capable of doing as a day ride in the Peak District National Park which is situated almost at our doorstep. We figured that if we could do that in the hilly terrain of the Peak District, we could do at least that in the less hilly terrain we were likely to encounter much of the time on the End. With very detailed route description, maps, and pictures. As a follow on to the C2C etc. As it says on the CTC Web site. To cycle from the far South West to the far North East of mainland Britain is an ambition which many cyclists fulfil each year. Includes maps, and plenty of pictures. One cannot make a 1000 mile bicycle trip such as this without a few amusing incidents. At Bettyhill on the final day we met a lady in a cafe where the following conversation took place Lady: ``So you are cycling. Have you come from far?'' Martin: ``No, not really. Only from Land's End''. Another report of a Coast to Coast ride. Very nicely laid out, and illustrated with black-and-white pics. 1014 miles in 16 days - a photographic diary. Ever since I bought my first ``proper'' touring bicycle I'd liked the idea of touring the Outer Hebrides and Western Highlands of Scotland. I'd done a limited amount of walking in Scotland before and had spent a few days travelling around Skye by car but I wanted to see more and a cycle camping tour seemed the best way of doing it. [In 2000] I booked three weeks off work and bought a rail ticket from Liverpool to Oban and a ferry ticket that would allow me to travel from Oban to the islands of Barra, South Uist, Benbecula, North Uist, Harris and Lewis and finally back to Ullapool on the mainland from where I planned to cycle to Cape Wrath, the most North Westerly point of the British Isles. Travelling by bike in England, Wales, and Scotland. Another fine and very nicely illustrated report from the impressive collection of Martin Wittram. An excellent report, with lots of practical information. Even if you don't know French, look at it for the beautiful pictures. Taking three weeks off to tour England by tandem was the trip of a lifetime. Great riding, good weather, and lots of help from friends along the way made a truly memorable experience for us. We planned relatively short mileage days and allowed several days off the bike for some typical ``tourist'' days. The riding in England was superb. The route we planned took us to some of the most scenic and pastoral settings imaginable. Except for London, riding in cities, towns, and villages posed no problems for a tandem. Using England's trains for covering long distances was relatively easy, but required some planning ahead to be sure space was available. 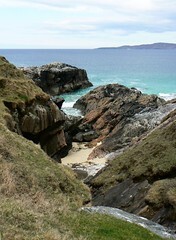 After lunch I coasted back down the hillside and took the southern fork along Luskentyre bay. This led me on round the west coast of Harris, a superb landscape of broad sandy bays, interspersed with black rocky points and all backed by the rugged mountains inland. I made my gentle way along here, pausing in particularly attractive spots to study the geology or write a postcard. Cycling in the Welsh hilly land. The splendidly organized (Ha, the Web!) report of an extensive tour of Scotland. A must-see! Balloch, Lochearnhead, Oban, Glenfinnan, Sleat Mountains on Skye, Portree, Shiel Bridge, Inverness, Loch Lochy, Kingussie, Elgin, Fraserburgh, Aberdeen, Aboyne, Bridge of Cally, St. Andrews, Edinburgh, Galashiels, Gretna, Parton, Ayr, Johnstone. Family cycling at its best! These pages are a little recollection of the holidays we took in the Highlands during 1996 summer. The main part of these Scotish holidays was a tour of the Hebrides and the Highlands. On our way down to France, we also made a stop to the Isle of Arran. It was a leisurely tour: about 650 km (400 miles) in 14 days. Certainly not a great feat for Martine and me, but more so for Nicolas, who was 8 and rode all the way. [...] I've always found that planning a route is very easy, as soon as an organizing idea has been decided. For our first trip in Scotland, I settled on ``riding the waters'': ferrying to the islands, musing along lochs, and paying a due visit to the most famous of all. We don't regret this choice. We are now specialists in ferries (from liners-like to pedestrians-only) and it was fun to see Scotland from the sea also. Our tour took us through several of the rural areas of central England, and we experienced very pleasant and relaxing cycling on the B and unclassified roads. This may come a bit as a surprise regarding that the area crosses the central urban and industrial belt stretching from Greater London to the Midlands (Birmingham). Menlo Park, London, Inverness, Aberlour, Aberdeen, Montrose, St. Andrews, Edinburgh, Yetholm, Rothbury, Once Brewed, York, Sherwood Forest. The Rough-Stuff Fellowship is a cycling organisation dedicated to the pursuit of cycling on bridleways, byways, drove roads and tracks. The RSF was formed in 1955 and now boasts over 1000 members nationwide with local groups scattered around the country. The Rough-Stuff Fellowship have a limited selection of off-road routes. These include: Eastern Alps, Central Alps, Western Alps, Massif Central, Pyrenees, Picos de Europa. These routes are listed in greater detail with maps descriptions of the route including exact position of the start and finish of each route. These routes have been compiled over the forty or so years the RSF has been in existence. It is important to note that the these routes have been completed by RSF members mostly using camping equipment and standard touring bikes, not mountain bikes. This has been a difficult trip, this touring in Ireland. Every day I've gone out on my bike, regardless of the weather. I've struggled against headwinds, winched up slopes that went on for miles. I've gotten wet a great deal, and gotten chilled quite a few times, only getting warm again by adding more layers and pedalling harder. I was really looking forward to this ferry ride back: a chance to relax and stay warm.